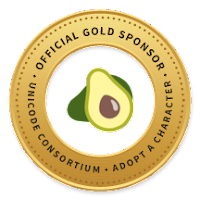 Avocados from Mexico’s sponsorship directly funds the work of the Unicode Consortium in enabling modern software and computing systems to support the widest range of human languages. There are approximately 7,000 living human languages. Fewer than 100 of these languages are well-supported on computers, mobile phones, and other devices. AAC donations are used to improve support for digitally disadvantaged languages, and to help preserve the world’s linguistic heritage. Avocados From Mexico are healthy, always in season and a delicious way to elevate go-to dishes into a nutritious meal. They provide naturally good fats, nearly 20 vitamins and minerals, are cholesterol- and sodium-free, making this fresh fruit a heart-healthy fruit. You can find more information and recipe ideas at AvocadosFromMexico.com. The Unicode Consortium thanks Avocados from Mexico for their support! All sponsors are listed on Sponsors of Adopted Characters. More than 128,000 other characters are available for adoption — see Adopt a Character.